Horizontal, ascending branching. Slow to moderate growth rate. Fall color is not showy. 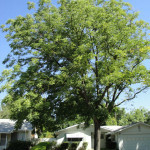 Female tree has large black to brown seed pods, choose male plants to avoid these. Good, dependable city tree. Brittle wood. Drought and pollution tolerant. Adapts to a wide range of soil types. 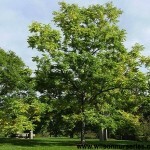 Oval to vase shaped tree with upright arching branches that present an elm-like form. Huge, double compound leaves give this tree a tropical feel. A seedless selection. Good tolerance of heat, drought and cold. A slow grower.